Anyone hoping that the departure of White House chief strategist Steve Bannon would signal a course correction — a pivot away from the Trump administration’s short (but prolific) history of ethno-nationalist pandering — must have been dismayed by the president’s performance last Tuesday night in Phoenix. For seventy-six excruciating minutes, in sweltering one-hundred-degree heat that dropped police officers, protesters, and #MAGA loyalists alike, Trump expelled more hot air of his own: pitch-perfect racist dog whistles, bemoaning the fate of Confederate monuments (“They are trying to take away our history and our heritage!”); meandering diatribes about the American lügenpresse (“If you want to discover the source of the division in our country, look no further than the fake news and the crooked media, which would rather get ratings and clicks than tell the truth. I mean, the New York Times has written some stories.”); a teaser campaign for his presidential pardon of Joe Arpaio, the former Arizona sheriff who faces six whole months of potential jail time for failing to obey a 2011 court order against racial profiling (“I’ll make a prediction. I think he’s going to be just fine, Okay? But — but I won’t do it tonight, because I don’t want to cause any controversy.”); plus the usual obsessional monologue over his crowd sizes; some petulant grudge litigation; the standard Two Minutes Hate for Hillary; and a little jingoism to warm up. It was all there. Trump said these things not because he is his “own strategist” — as he put it to the New York Post during Bannon’s precarious near-exit last April — but because Bannon’s work here is done. The circle is now complete. Years before he formally entered the Trump campaign, Bannon operated a payola scheme at Breitbart to signal-boost pro-Trump media narratives. He boasted to friends in private emails about being Trump’s secret “campaign manager” and publicly coached him on policy and messaging during hours of interviews on Breitbart ‘s SiriusXM radio show. And so, after a tactically offensive, lib-triggering engagement in the West Wing, Bannon has decamped one month ahead of schedule: an eight- to twelve-month tour of duty that he only half-jokingly set for himself as far back as February. Bannon is now a “populist hero” to his fans and Breitbart News , the billionaire-backed, far-right opinion machine to which Bannon has since returned, as its once and future executive chairman. Bannon told allies that he had hoped to ram through as many key policy proposals as possible while his opponents remained on the defensive — a frequently ham-fisted and performative exercise seemingly intended more to excite Trump’s base, and troll his critics, than to actually affect governance. And yet, executive decisions were made. Goals were met. Acting in concert with Scott Pruitt, Trump’s mission-negating head of the Environmental Protection Agency (EPA), Bannon spent months scheduling meetings between the president, conservative activists, and fossil fuel industry executives to ensure US withdrawal from the Paris Climate Accord; the pair outmaneuvered not merely Jared and Ivanka, but a powerful faction within Trump’s own cabinet, including Goldman Sachs alum Gary Cohn and former ExxonMobil CEO Rex Tillerson. Despite the ongoing battle over Trump’s travel ban, arrests of undocumented immigrants continue to escalate, swelling detention centers and log-jamming federal immigration courts with tens of thousands of additional human bodies — among them the parents of American-born children and American-raised adults adopted by US citizens decades ago. Elsewhere, the plan that Bannon once described as the “deconstruction of the administrative state” proceeds apace, in federal agencies too numerous to mention, now staffed by former industry lobbyists and lawyers, Heritage Foundation apparatchiks, and even a few of the empty suits bested by Trump in the Republican primary. What Bannon knows now, of course, is whatever classified material he has managed to ingest with the benefit of a top-level security clearance and an open invitation to sit in on National Security Council meetings — a privilege that Bannon managed to retain even after his removal from the council’s principals committee in early April. Unambiguously, Bannon is required by law both to report any leak of classified material that he knows of, and to preclear any item of classified material that Breitbart News wishes to publish. How Bannon will reconcile this with his reprised role as a news media executive is anyone’s guess. But Bannon has managed in the past to juggle multiple senior-level positions to maximize a kind of media-brand arbitrage in the service of his political aims. 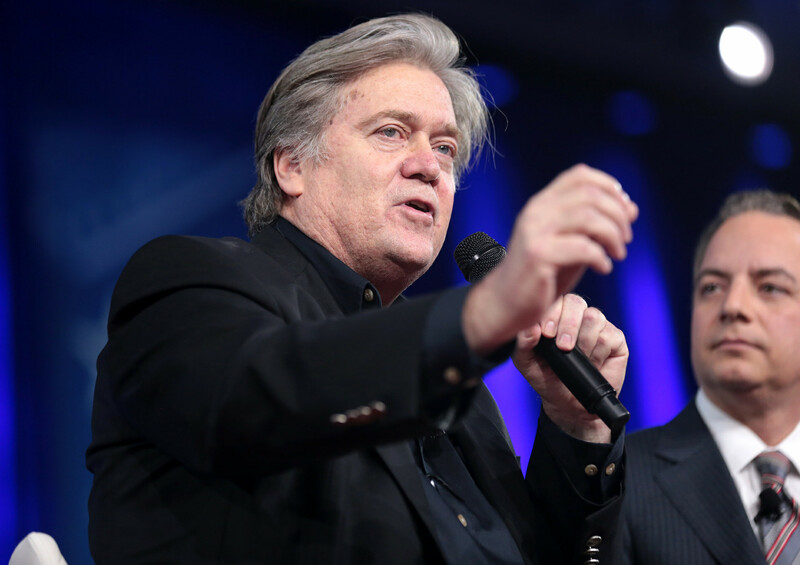 While simultaneously helming Breitbart and the ostensibly nonpartisan, nonprofit Government Accountability Institute (both funded by his political patrons, Robert and Rebekah Mercer), Bannon managed to get research-intensive and ideologically slanted news items placed in several major outlets, including the New York Times . So, it would not be surprising to see Bannon concocting even more baroque cut-out arrangements to anonymize and launder any new information he found damaging to his own private enemies operating within the Trump administration: “globalist” bureaucrats, “cultural Marxists,” etc. One of the few certainties following Bannon’s ouster is that the so-called “propaganda document” — a surreal twenty to twenty-five page dossier of positive news coverage, flattering cable news screencaps, and gushing pro-Trump tweets, delivered twice daily to the president — is now sure to become a whole lot thinner. The administrative reality within the executive branch, however, is probably a lot less dire for Bannon’s supporters — and far grimmer for opponents hoping to celebrate his departure. Bannon leaves behind a series of key appointments, both well-known and unknown, who are likely to keep their heads down, dutifully busying themselves with the enactment of their shared policy agenda. At the CIA, new director and former Tea Party congressman Mike Pompeo upholds Bannon’s fevered, medieval outlook on radical Islam and its purported existential threat to “Western civilization.” As Pompeo told a church group in his former Kansas district, he regards the “struggle against radical Islam” as “the kind of struggle this country has not faced since its great wars.” Pompeo’s views on the CIA’s infamous torture programs (lax) and the Iran nuclear deal (hawkish) are also perfectly aligned with Trump’s departing chief strategist. Likewise: it is doubtful that Bannon’s premature exit will spur any changes in the work of the antigovernment wrecking crews he helped appoint at the EPA, the Department of Energy, the Food and Drug Administration, and elsewhere. While a purge of Bannon allies appears ongoing inside the White House itself, with scholar-manqué Sebastian Gorka summarily fired/resigned and former Breitbart reporter Julia Hahn rumored to be next — even their departures leave them simply back at Breitbart HQ (or somewhere else) burnishing newly minted credentials like “former deputy assistant to president of the United States” for their cable news chyrons. Having cultivated a solid rapport with Trump’s son-in-law, Jared Kushner, senior policy adviser Stephen Miller will remain committed to fostering the president’s most white nationalist tendencies, without his “glory hog” of a former mentor, Steve Bannon, to rock the boat. And then there is Trump himself, whose nativist rhetoric and deeply personal sense of white aggrievement predates his relationship with Bannon by decades. Bannon leaves the West Wing with real power in two of the few remaining pathways to the president still beyond the reach of his new disciplinarian, John Kelly: Donald Trump’s cell phone, which he uses daily to seek advice from trusted outsiders, and the cable TV news cycle from which he cannot look away. Over the past year, Bannon’s opponents have been caught with two, dialectically opposed, and mostly useless, cartoon depictions of their foe. Bannon was either the dark wizard of white racial resentment, pouring poison into Trump’s ear, Rasputin-like, with the skill of a great manipulator; or he was merely a self-aggrandizing slob, the piss-drunk granddad whose only lasting impact on the presidency was likely to be unreported property damage or a persistent necrotic odor. These caricatures — while a boon to activist morale and fundraising emails — have offered little in the way of explanation for Bannon’s political successes or his recent ouster. Both Trump and Bannon bear more than a passing resemblance in their vision and demeanor to the prestige TV visage of Tony Soprano: a North Jersey mafia don plopped on his couch in front of the History Channel, revisiting World War II with a bowl of ice cream. These are shrewd men who are, nevertheless, comically paranoid and self-indulgent. Neither man is temperamentally suited to the broad administrative duties of national office — but Bannon differs from Trump in that he has always been smart enough to know that, devoting himself instead to destructive termite activities in furtherance of his goals.